In 1922, The Farmer's Wife magazine asked their readers if they would want their daughters of marriageable age to marry a farmer. At the time, the magazine had a readership of about 750,000, and they received 7,000 letters. Spoiler alert: the majority of women were for it. The letters are wonderful. They are well written and show the women on the farm to be diverse and extremely fulfilled. "Wee daughter is having her nap and it's a good opportunity to tell you why I wish the best of all things for our pride and hope and joy. "It is because I have known the happiness which comes of service, that I want my daughter to know it, too. Is there any greater joy, I wonder, than that of a hard task well done?" And with that thought, I must get back to my spring cleaning. 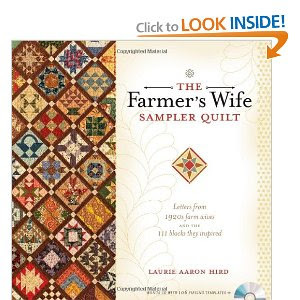 And while I clean, I will dream of a pretty Farmer's Wife quilt. I have added working out back into my schedule. My legs feel like jello. But, it's a good thing. I am down yet another two pounds. Woo to the hoo! I feel pretty darn good. But my muscles, they are sore. So I also feel I need a massage. On Monday, I did one of my workout videos. Patch thought it was awesome, and tried to do some of the moves. He looked a little better than I, as much as I hate to admit that. My body is not so used to moving, and my hips have not wiggled at all in the past year. I went to my Zumba class yesterday and felt as awkward as a 13 year old girl at her first school dance. The instructor kept saying "Jana, just shake your hips!" Sadly, everytime she said that, I thought I was shaking my hips. We have another appointment with the YMCA playroom this morning, and I am going to spend some quality time on they elliptical while watching The Gilmore Girls. Today is our first day with Flower in 2 weeks. The family has not seemed complete. At breakfast this morning, Mini-me said: "Are we finally getting Flower today?" Two weeks is a long time without your sister, especially when you're six. Even though the kids are excited to be reunited, I'm taking bets on who cries first this afternoon. My money is on Mini-me. This week was spent sewing for the new etsy shop. My favorite thing? This apron. Go check it out! Again, linking up on Amy's blog! I am down another 2 pounds. Can you believe it? I can! I'm working pretty hard here. With this 2 pounds, I am down a total of 11.8 pounds and have passed my 5% goal. It's pretty great. And, now that the sun is shining and the temperature is warm, we've been doing a lot of walking. Yesterday, Patch, Ginger and I walked the nearly 12 blocks to the Post Office. It was wonderful. Hooray for Spring! The sun is shining! And now I must go walk in it. Or on it. Don't it feel good? 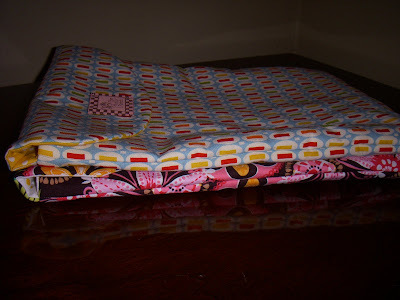 For those who do not quilt and read my blog, please forgive me. For those that do quilt, you will understand my excitement. Maybe. Have you been to the Modify Tradition blog? If not, GO NOW! Then come back here. There are several reasons I like this blog. They do giveaways, they give clear instructions, and they are all about the kind of quilting I like. 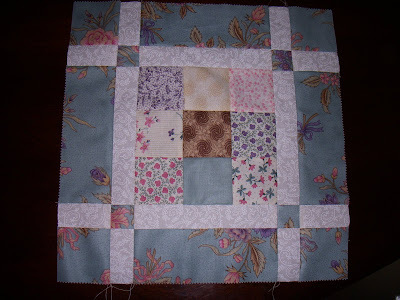 I love traditional piecing. I love good, old-fashioned blocks. A quilt made of Ohio Stars just makes my heart sing! But, I love modern fabrics and color combinations; red and aqua, pink and orange, blue and brown. This blog has all of that, plus fun instructions for what to do with those blocks as an alternative to a full-blown quilt. It's just awesome. 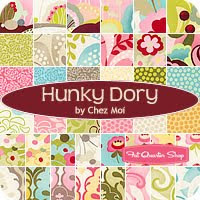 Also, thanks for the encouragement about my new etsy shop! It's really coming along. I contacted Bitsy Creations, and Joan (the master-mind behind it all) came up with some fantastic stuff based on my existing Molly Patch logo. To see it, go here. To have Joan come up with something fabulous for you, go here. I got small things finished this week. But hey, small things are better than no things, right? First up: Block #1 for the Jelly Roll Sampler Quilt-Along. I'm using a jelly roll (pre-cut strips of 2.5 inches, all wrapped up like a pastry, for you non-quilters) that I won from the Fat Quarter Shop. It's way more traditional than I normally like. 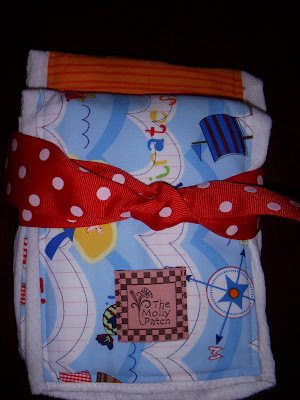 Second: Two Daddy Diaper Totes for my little business. 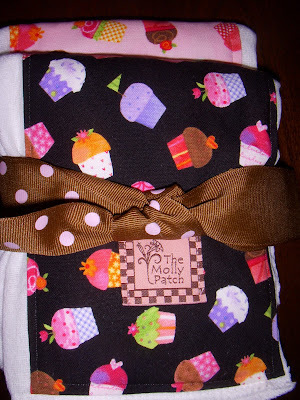 Third: Burp Cloths, again for The Molly Patch. 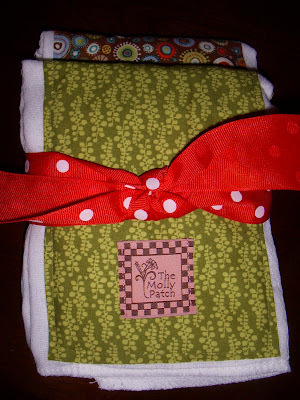 I have decided to open an etsy shop for The Molly Patch. It will hopefully be up and running by next Friday. Check back here or The Molly Patch blog for more details. For those stopping by from Amy's blog, please keep coming back. 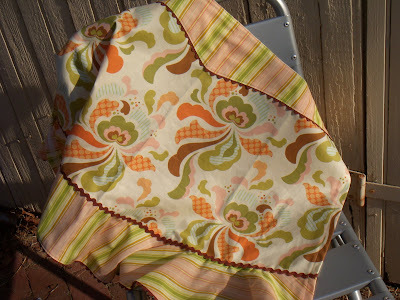 I plan on doing Sew and Tell during Amy's blogging break. Hope you do the same! When the kids woke me up this morning, pre-alarm at about 6:45, Mini-me asked if she could buy her lunch at school today. I responded: "No, honey. It's Saturday." I have no idea what my dream was before I woke up, but apparently it involved the weekend. I was slightly disheartened to figure out that it was actually Wednesday, but that lasted a short moment. I have a lot to do this week and can't afford to lose days! My Weight Watchers weigh in went well yesterday. 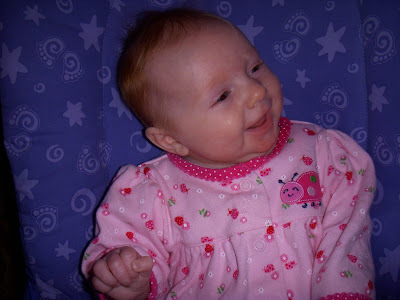 I am down another 1.8 pounds, which brings my grand total to .2 shy of 10 pounds. Next week I should hit my 5% goal. I must confess, I am only doing the eating portion of WW right now. I have not added exercise back in. Lately I have been exhausted, and I'm not sure why. Ginger is mostly sleeping through the night, but I find myself dragging at times. I know what my dad would say. He'd tell me to go to the gym and get my energy back. He's right. So I'll do that. Maybe tomorrow. Patch and I have gotten into a great Tuesday routine. We take Mini-me to school, and then get in the car to go to my meeting. After WW, we head to the library. Then, we have lunch. Yesterday I took him to the Scottish restaurant, because a lady nearly ran him over when she decided she wanted to drive on the sidewalk. I know, I know. We shouldn't soothe with food. But nuggets and fries were the balm to his wounded heart. He stopped crying and talking about the "mean lady" once food was in hand. After lunch, we go to the YMCA for open gym. He runs and runs and jumps and runs some more. We come home, have a little rest, and then pick up Mini-me from school. We love Tuesdays. This afternoon, we are headed to pick up Flower from school. It's our last day with her for 2 weeks. It's her Spring Break next week, and it's her mom's year to have her. We will miss her, but I have big plans to get her room finished. Hopefully it will help keep my hands of the crackers. Yesterday was a good weigh in. I was down a little over a pound, which makes for 8 pounds total. Even better than the pound was the fact that I was wearing pants with a zipper. 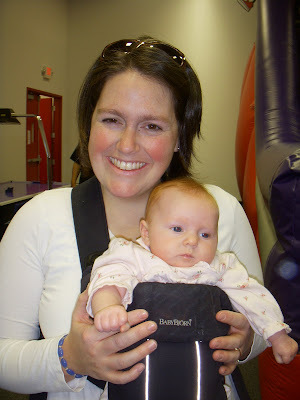 You don't realize how miraculous zippers are until forced to wear ill fitting, elastic front maternity pants. It's a good thing that babies are worth the sacrifice. I was joined at the meeting by my friend Debbie. Let me just take a moment to say that if I looked like Debbie, I would not be worried about my weight. She looks fabulous after 3 kids. I am fairly certain she only has 5 pounds to lose. Any more than that, and she'll be too thin! But that's the thing about weight loss. It's personal. Once we feel good inside and out, we're done. And where that is for me is different than where that is for you. I just know that for me, I still have a ways to go.